Simplenote, one of the most popular note-taking apps which was first started on iOS, now is available for Linux Desktops. Simplenote blog announced the release of Simplenote for Linux (and Windows) on Tuesday. It’s an open-source application that is built with React and runs on Electron. History: drag the History slider to view previous versions. Collaboration: share your note with others and allow them to edit. Publishing: make your note public with its own URL. Tags: organize your notes effectively with tags. Pinning: pin notes right from the note list so they’re easy to find. Enable globally in Preferences -> Writing -> Enable Markdown. 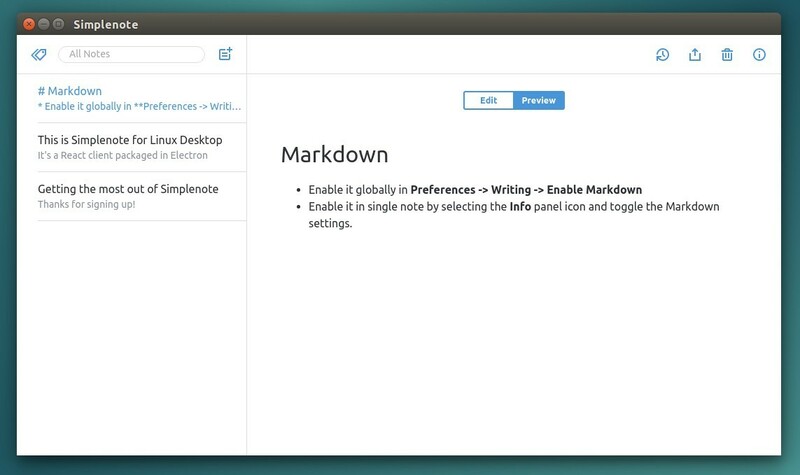 Enable in single note by selecting the Info panel icon and toggle the Markdown setting. Download the .deb package from its website, then click install via Software Center. has no Ubuntu Linux 32 bit version (? ).